I forget exactly how I first came across this topic, but it’s likely I’d found out there was a town in America called England. When I saw where it was, I panned across the landscape to see a school Geography lesson in action – beautiful meanders in the Arkansas River, oxbow lakes a-plenty, and a patterned landscape showing the history of the river. The visual Geography lesson that sparked my imagination. I then did a bit of googling to find out some history of the area. 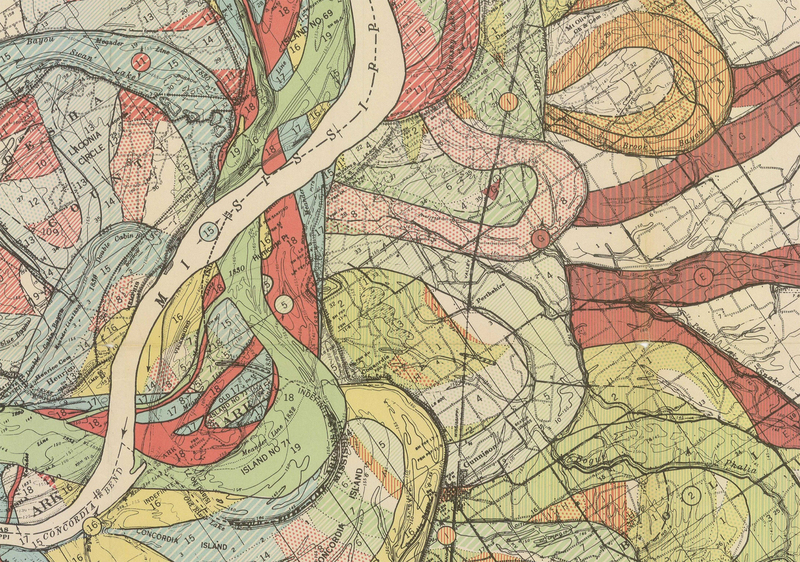 It turns out that the Arkansas River, and the neighbouring Mississippi, were heavily, and beautifully, mapped during the 20th Century – and the maps are all available as an online resource. With this resource of historical maps, it seemed prudent to try and visualise some of the change from then until current aerial imagery. In fact, many were ‘meander maps’, showing the change in the river over time, thus combined with modern imagery, an extension could be provided to the work carried out by surveyors earlier in the century. And all with a few clicks of a mouse sat at a desk – how the world has changed! Each color represents an old channel, dating back 1,000 years or so. Those that correspond to historical records are dated, while older channels are ordered according to the principle of superposition. There were a few blog posts showcasing the maps of the Mississippi, but not much I could find that took the resource one step further, apart from a brief post on NASA’s Earth Observatory site. In fact, the resource provided by the US Army Corps of Engineers even had a small set of georeferenced TIFFs to play with. An original black and white map of the England, Arkansas area vs current aerial photography. The change over time of the river system near the Mississippi-Arkansas border. The brilliantly-named Yazoo River, shown here in the Lamont region. 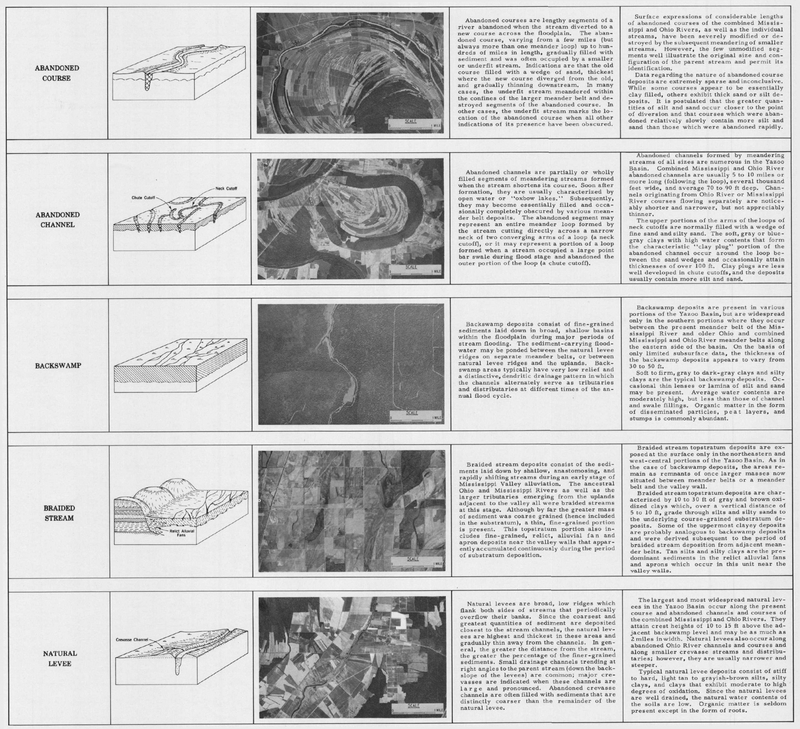 Cross-section of river basins, with vertical exaggeration. The Mississippi-Arkansas border, with time as a flickering gif. Arkansas basin – The England map was from Keo district. Arkansas-Mississippi border – Sheet 17, NB this is a big download of rectified TIFFs. Yazoo basin – The map used was from Lamont. 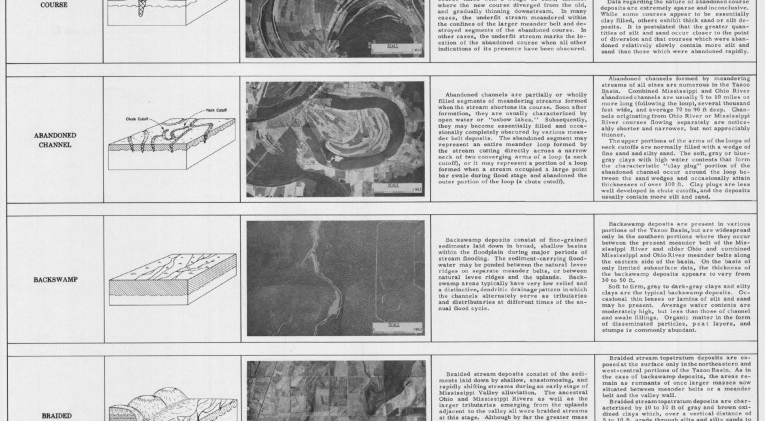 The full set of maps from the US Army Corps of Engineers. The England and Yazoo aerial photos were taken from Google Maps, overlayed in PhotoShop. The Arkansas-Mississippi border map was overlaid on a BaseMap with ArcMap. All gifs were made with Gif Maker. In trying to display the changes over time of these maps, I ended up creating a system using a combination of jQuery and CSS. The key here is to be able to fade one image over another. This can be done by manipulating opacity settings, but the images must be aligned. This can be done relatively easily by placing them both in a position:relative div, then setting the images to position:absolute. Our use of position:relative images, creates a problem. We want these images to be scalable so they work on all devices, so they can’t have set widths and heights. As position:absolute elements don’t affect the parent div’s dimensions, this means anything coming after these images on the page would be placed immediately below the top of the div – useless! This entry was tagged GIS, maps, old maps, rivers. Bookmark the permalink.